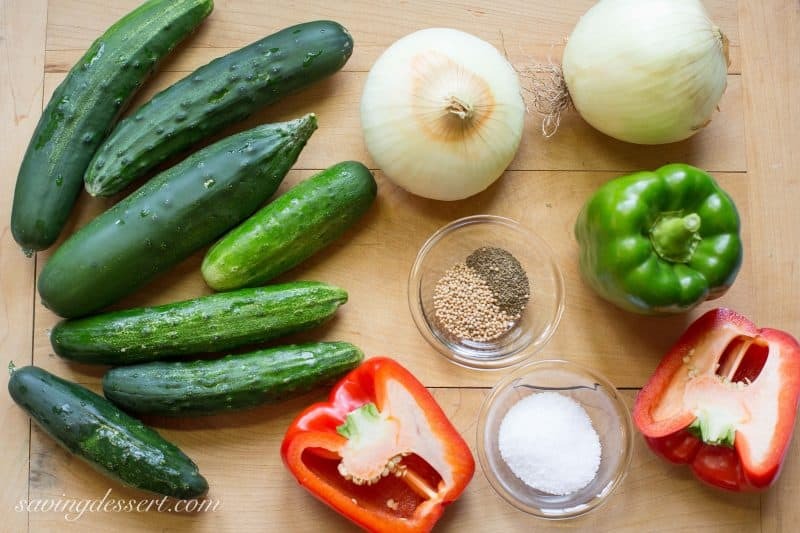 Homemade Sweet Pickle Relish – made with fresh from the garden cucumbers. Delicious served on hot dogs, deviled eggs or in all your summer salads. We’ve got cucumbers … lots and lots of cucumbers. I eat them everyday for lunch with no complaints! I need to make pickles but thought Homemade Sweet Pickle Relish might be a nice change. My husband planted about 4 different varieties of cucumbers so I can’t even tell you what kind they are, other than the good kind! Aside from a little chopping, relish is super simple to cook and a real treat to eat. 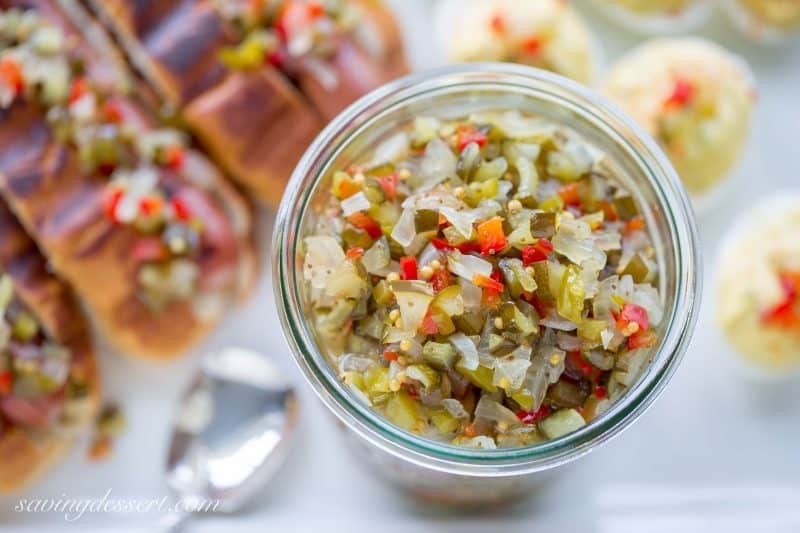 Lightly sweet relish reminds me of my Mom’s Bread & Butter Pickles and that’s a good thing! Dice the fresh vegetables and place all together in a large pot. Combine cider vinegar, sugar, salt, mustard seeds and celery seeds and cook for about 10 minutes. 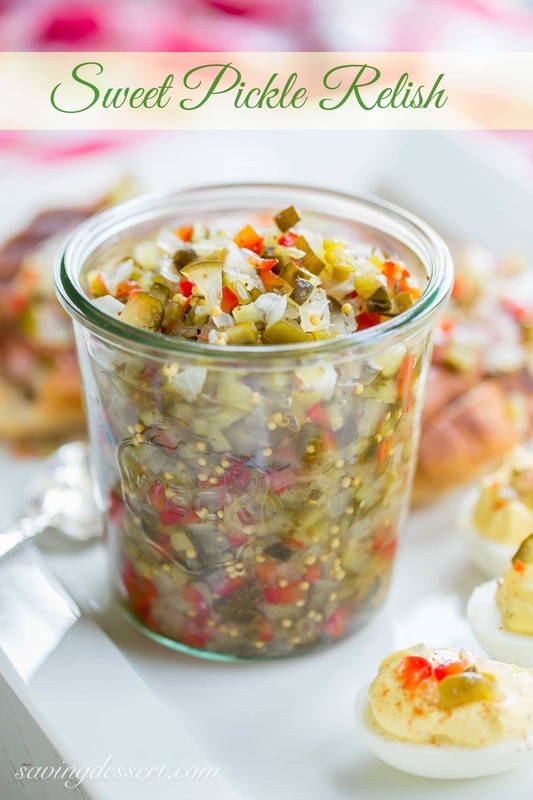 This is an amazing relish great served on hot dogs or mixed into deviled eggs. In fact these are some of the best deviled eggs I’ve ever had. The fresh relish really took them to a whole new level of deliciousness! 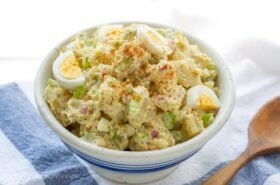 Delicious served on hot dogs, deviled eggs or in your summer salads! 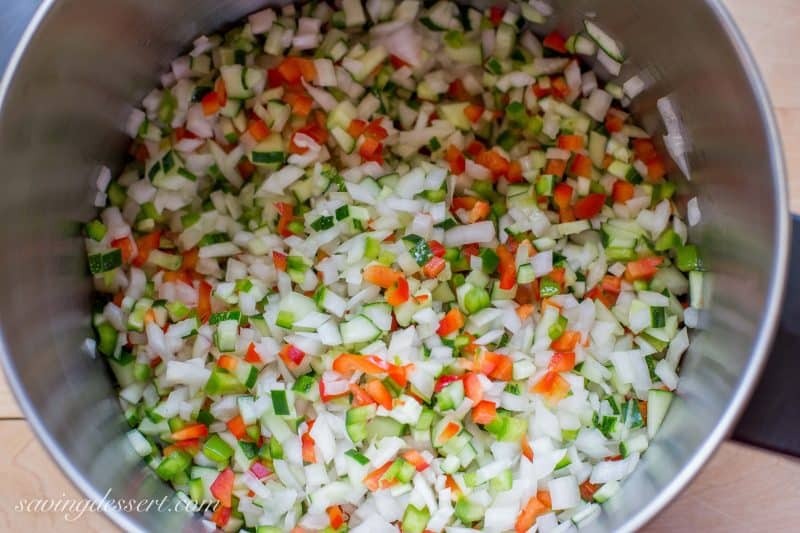 Combine the diced cucumbers, onions, and peppers in a large stock pot. Sprinkle the 1/4 cup kosher salt over the vegetable. Fill the pot with ice cold water enough to cover the diced vegetables. Set the mixture aside to rest for 2 hours. Line a fine mesh sieve with cheesecloth and add the vegetables. Allow them to drain for 10 minutes or so, then gather the ends of the cheesecloth together and twist to form a bundle. Squeeze a little tighter to press out the liquid, allowing it to drain. Don't smash the vegetables but extract as much liquid as possible. While the vegetables are draining, combine the vinegar, sugar and seeds in the large pot. Bring the mixture to a boil and add the vegetables. Stir and bring it back to a boil. Reduce the heat and simmer for 10 minutes. 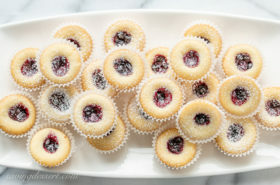 Using a slotted spoon, place the hot relish in glass jars with lids. Spoon additional brine over the vegetable if needed to cover. Process according to standard canning procedures if preserving. I placed mine in Weck jars and refrigerated until ready to eat. It should keep a couple of weeks if kept cold. 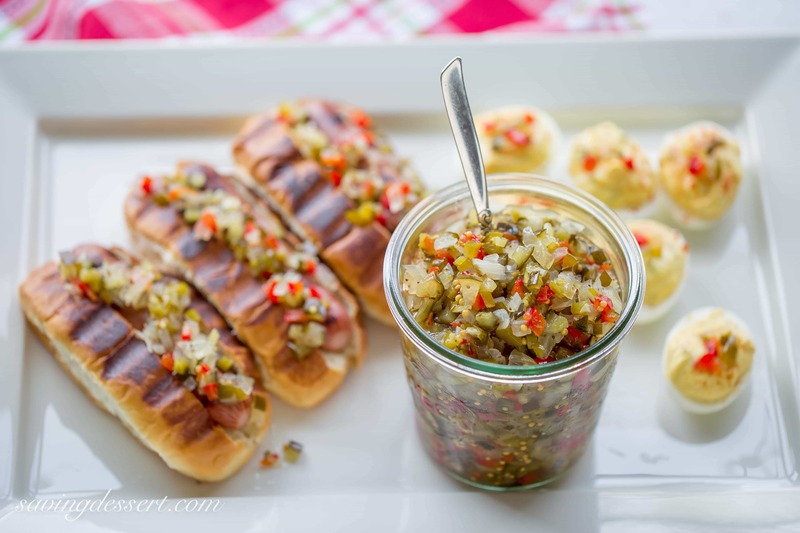 Pickle relish seems like summer to me! Are you getting ready to go back to school? Planning any late summer vacations? I can’t believe how quickly it has flown by. I hope you are able to squeeze in a few backyard BBQ’s before we drag out the pumpkins. Thanks so much for stopping by! Never even thought of making my own pickle relish. But I should — we have cucumbers coming out of our ears. OK, not really, but you know what I mean. 🙂 This looks awesome — thanks so much. I have lots and lots of baby cukes on the vine waiting to grow up. 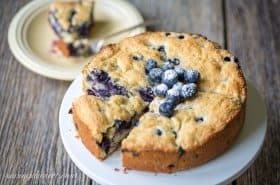 I can’t wait to try this recipe when they do, Tricia. Pinning to my canning and preserving board! 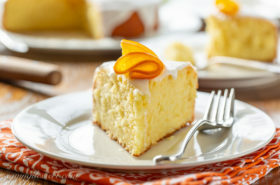 I hope you get the opportunity to make this Susan – it is so tasty! I love this Tricia! It looks so fresh and flavorful. So much better than the watery version at the store. Beautiful dice on all the veg! Thanks so much Toni! It is so good and really does taste fresh. Anything homemade is so much better and your relish looks great. My mother canned all time. My mother did too Gerlinde. I wish I had more time to do it! Have a great week. I have not canned one thing this entire summer, and I just have a few days of summer vacation left! My two cucumber plants have been prolific though, and I just may be able to squeeze in a batch of this before reporting back to work next week. How does the summer fly by so fast? I can’t believe summer is almost over Betty. I bet you will be busy getting all those things done you wish you had finished. I feel the same way each and every weekend! There is never enough time 🙂 Have a great week and best wishes for a wonderful school year! This looks so colorful and fresh, I think I’d end up with a 2 to 1 ratio of relish to hot dog! Good plan Sue! 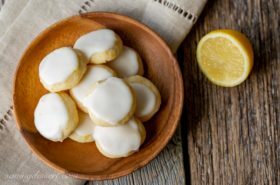 I can’t believe how much better homemade is compared to store bought (or maybe I can!) Thanks! You even make relish mesmerizingly beautiful! : ) It looks wonderful, all the better with your own homegrown cucumbers. Hi Tricia, isn’t amazing that even condiments tastes better homemade and with fresh ingredients. Looks like once again you took it to a new level. I want to make this..I make our relish..but this is so different! Thank you Monique. Hope you love it! 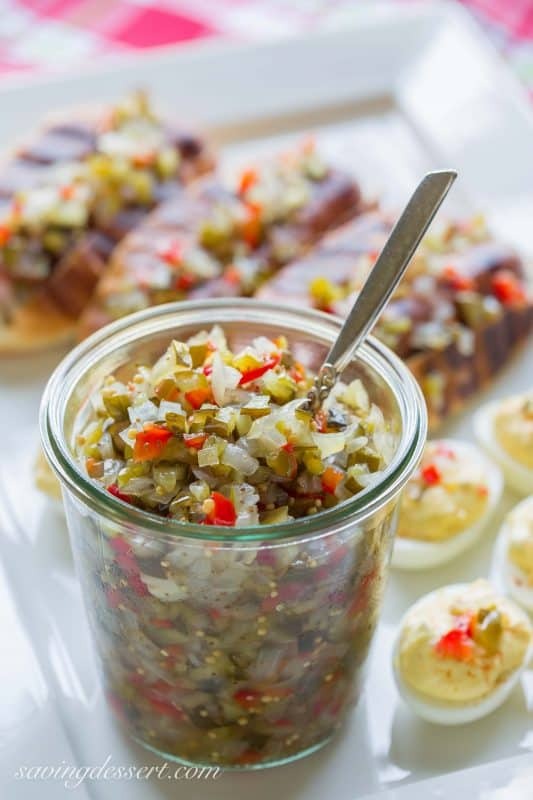 I’m not a fan of sweet pickle relish, but yours looks delicious. Thanks Larry – it tastes a lot like Bread & Butter pickles. Happy travels! I’ll take mine right out of the jar. I see you have a spoon waiting for me. It looks fabulous! Thanks Chris – it is really good on everything!